I recently read related posts on Dan Brown’s Green Onions and Brad Hill’s Unofficial Google Weblog regarding the buzz about the supposed demise of “folders” on personal computers. Dan discusses this buzz – that people may be moving away from classifying electronic information based on a hierarchical “folder” framework, instead complementing this habit by applying the concept of attributing “labels” (often more than one) to this information. Dan appears not to buy into this theory, instead arguing that the the concept of folders (or a hierarchical structure of organization on personal computers) may not become obsolete because the “human mind loves part-whole organization.” I agree. I have recently upgraded to Apple’s iPhoto 5 and Tiger. I like Apple’s implementation of the “smart folder” (available for the entire filesystem, not just in iPhoto) because it appears to bridge the continuum between navigating a hierarchical tree of folders from scratch and creating a search strategy from scratch. Not to be left out in the cold, Microsoft too plans a similar “virtual folders” option when it introduces its long-awaited Longhorn OS. What I enjoy about the concept of the “smart folder” is that I can create these dynamic folders within or outside any application like iPhoto to organize files based on specific “keywords” (or other criteria) I attribute to them. Unfortunately, iPhoto appears to only allow you to apply one keyword per photo. This is great if it’s just a pic of your house using the keyword “home,” but what if you only want to locate pictures of the kitchen? If I create a “smart folder” that keeps all photos with the keyword “home” together, then I may very well have to wade through many photos before locating the pictures of the kitchen. A search for “kitchen” will not locate any of these photos, simply because there is no meta-data stored for this classification. What am I to do? One method might be to use the file’s comments field to apply multiple tags of meta-data, but that can be time consuming to do for each and every photo I import onto my computer. As hard drive space becomes ridiculously cheap and people begin to save their life’s work onto their personal computers, the dilemma comes down to applying rich meta-data to pieces of information (text, media, etc.) so that it can more easily be retrieved later on. Some pieces of meta-information are automatically saved (filename, date, filetype, author info) and text documents can be indexed and searchable, but as previously mentioned, some rich meta-data may be missed. The reality is that people are simply unwilling to spend the time to apply rich tags to information so that it can easily be retrieved at a later time. 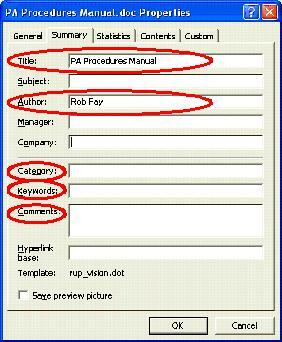 For example, how many of you actually add rich information to your MS Word files? Did you even know you could enter information into the category, keywords, and comments fields to aid in file retrieval? Perhaps you might argue that it is irrelevant because search systems can search on every piece of text within the Word document. Or you might argue that it is unnecessary because you are the only person who will need to locate the file in the future. However, consider this example: Suppose I write a sports article about Alex Rodriguez, third baseman for the New York Yankees. Suppose the article mentions nothing about his nickname “A-Rod” yet that might be the only word a co-worker can think of when electronically searching the company’s network for the file. It’s been interesting to see how people use del.icio.us for organizing and sharing bookmarks. To extend the example, I would argue that a majority of del.icio.us users might only apply a single tag such as “baseball” to classify an article about the Washington Nationals rise to first place in the MLB standings. Fewer users will take the time to tag the article with multiple labels such as: baseball, major league baseball, MLB, Nationals, Washington Nationals, even though this classification is much richer and would more easily assist the user for retrieving this article at a later date. 2. Automated “Smart” Tagging – Perhaps a tool like Apple’s Automator could relieve some of the burden of adding meta-data to files. For instance, what if a script could be generated to create multiple tags (hierarchical or flat) when I simply added one comment to a file? For example, let’s say I add the previously defined tag “nyt” to the comments field of an article I wrote referencing the New York Time’s move towards offering a paid subscription model. Wouldn’t it be great if an automated user-defined action, upon saving the file, would also automatically add the following tags to the file for easier retrieval: NY Times, New York Times, newspaper, news, etc…? The idea might be that users could associate keywords or shortcuts to automatically generate multiple meta-tags. I’m not sure we can get a system to predict our classification and search and retrieval methods with 100% accuracy. While this might happen more successfully with text-based files, rich media files need to have some basic classification conducted by human interaction with the file, preferably when saving the file. 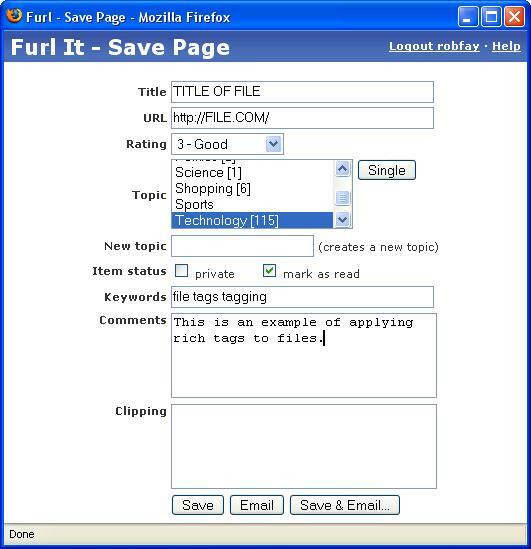 If people can spend a little time now adding a bit more rich meta-tags to their files, then I believe some wonderful automated tools might make the tasks of organizing, searching and retrieving much easier.